Riesling is always the next big thing, even though it never gets there. It is a poor unfortunate, maligned grape in Ireland. Always considered to sweet, people balk as soon as you pick up the tall Flask bottle. Riesling is the poster child for identity crisis. Normally considered sweet but in many cases bone dry. I love Riesling! It is a delight to drink. It’s instantly inviting when open, with lovely ripe fruit aromas or ‘petrol’ notes if its more mature. In the mouth, usually an intense fruit explosion followed by zesty acidity or in the sweeter styles a lingering fruitiness. Pure, fruity and unoaked, Riesling gives you only the pure flavours of the terroir and grape itself. Riesling’s fine structure and naturally high acidity give it a unique vibrancy, making it very crisp and refreshing. In terms of food pairings it is really versatile. The nearly infinite diversity of sweetness levels, regional styles and individual vineyards means that there is a Riesling to fit any wine-drinking situation, with or without food. Two dry styles from opposite ends of the globe are below. O’Leary Walker ‘Watervale’ Riesling, Clare Valley, AustraliaPale straw in colour with a green tinge. Aromas of lime with hints of lemon and chalk. A wine of great fruit purity. Intense varietal citrus, refreshing acidity and beautifully balanced. Strong green yellow in the glass, juicy stone fruit aromas on the nose, compact and minerally on the palate, with crunchy granny smith flavours and a touch of spritz. Many of you are familiar with the lovely wines we import directly from Weingut Muller who are based in the lovely Kremstal region of Austria. Now it’s mainly their whites that people chase after in here, but I gotta say I’m quite partial to their juicy fruit driven reds. Most of their reds are based on the indigenous Zweigelt, a red wine grape variety developed in 1922, at the Federal Institute for Viticulture and Pomology at Klosterneuburg, Austria, by Fritz Zweigelt. It was a crossing of St. Laurent and Blaufränkisch. Wines based on this grape have aromas of dark ripe cherries and dark berries, are spicy, have medium tannin levels and sometimes very good acidity. Now with that out of the way I’d like to introduce you to the Muller ‘Laurenz’ St. Laurent Zweigelt 2012 a blend of the aforementioned Zweigelt with one of its parent varieties St. Laurent which is typically found in Austria and the Czech Republic. St. Laurent delivers dark, sturdy and fruity red wines with morello cherry notes, quite similar to Pinot Noir. There are 2,243 hectares of vineyards located around the town of Krems in Austria. The town and ints eponymous wine regionare located to the east of the Famous region of Wachau. As in Wachau the River Danube is very inmportant. Views of the region are dominated by the magnificent Stift Göttweig monastery. As a DAC Kremstal was only introduced in 2007 and applies only to two grape varieties the Austrian Gruner Veltliner, which is typical vibrant and spicy here and mineral rich Rieslings.Like the Wachau, Kremstal has its fair share of special climates: a cool, humid northern breeze flows from Waldviertel cooling the warm dry eastly winds from the steppes to the east. Along with the two varieties mentioned above Kremstal produces Chardonnay, Weissburgunder and supple, soft and expansive reds from grapes such as Zweigelt. 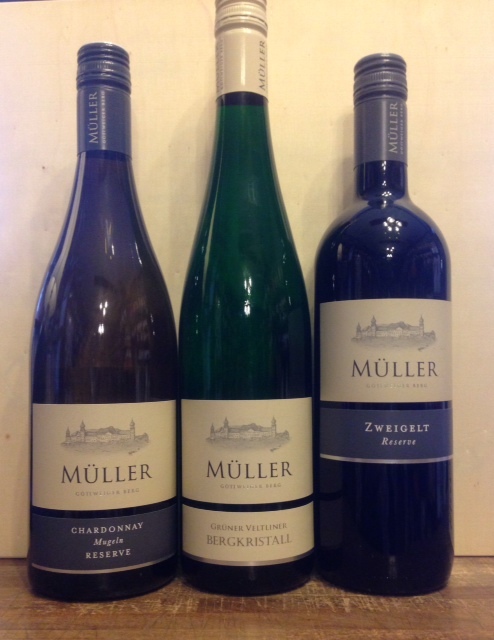 The wines of Weingut Muller need no introduction but below are 3 of our personal favs. Light green-yellow in the glass, opens up in the nose with a wide range of different fruit aromas including grapefruit but also tones of garden herbs and excellent minerals. The palate has a beautiful distinction and finesse, delicate nuances of apples and pears in the finish. A perfect companion to any hearty white meat or pork dishes. Great with ‘Wiener Schnitzel’. Ruby and garnet colors in the glass, beautiful scents of cherries and fine spices develop in the nose, nice subtle oak tones, powerful and substantial on the palate; a wine with a good aging potential. This wine is well suited for a myriad of hearty meals such as beef, lamb, and game, or spicy pasta. It is also a fantastic wine to consume on its own by the glass. Medium yellow colour, ripe orchard and stone fruit on the nose. On the palate complex and powerful, already very harmonious, with lovely rounded stone fruit flavours complimented by fine toasted oak flavours on the finish. This wine is a match for the most hearty dishes especially those with butter and cream. Here we go again harping on about Austria but it is in our opinion one of the most exciting wine-producing countries at the minute. Austria produces less than 1% off of all the worlds wine – roughly 27 million cases a year! All of this comes from the Eastern part of the country where the Alps wind down into hills and almost all of it comes from small family run wineries. As with many things the Austrians themselves are always evolving discovering new areas for vines and better growing conditions for the grapes they have, in essence there is more to Austria than the Wachau. The Wachau is probably the most famous area in Austria for the production of wine. It is in fact a world heritage site (since 2000). It is in the valley cut by the Danube as it winds its way through central Europe, between the towns of Melk and Krems. A cool climate region that has terraced vineyards along the river like in Mosel, Germany and Cote Rotie, France. Main grape varieties grown are predominately the indigenous Gruner Veltliner and Riesling along with Pinot Noir, Chardonnay, Pinot Blanc and even some Traminer and Sauvignon Blanc. Since the vintage 2009 the Müller family has cultivated 10 ha in the Wachau region. These vineyards are part of the monastery Kremsmünster estate which was founded in 777 AD by Bavarian Duke Tassilo III. The same soil has nurtured vines since 893 AD, thus producing the grapes so unique to the area. The Tassilo Cup, being one of the most valuable pieces of the nearby monastery’s art collection, was chosen as the centre piece on the label for the new wines from this region. From this site, over a thousand years old, come the characteristically fruitful vintages called the Tassilo Wines. Light green yellow in the glass, delicate nut aromas in the nose, elegant and powerful on the palate; an excellent wine with a great balance and length. The perfect companion for spicy and flavour rich dishes as well as elegant fish. Without a food pairing, this wine is well suited for any special occasion. The wine also possesses the ability to improve over the next 5 years. Bright green-yellow in colour, on the nose aromatic with delicate flowers on the palate, fine textured, juicy and elegant. Tender green apple on the finish, a spicy, typical Veltliner. A superbly refreshing wine. Serve chilled as an aperitif! As well the perfect companion for spicy meals or Asian cuisine and salads, but also has the body to stand up to pork dishes.